How about just a postcard, maybe? Souvenirs get expensive actually. I used to bring the kids things, but they already own so many things. New things that were actually in my budget (and I go away at least 4 times a year) just ended up in already existing piles of things, forgotten minutes after they were received. Postcards, though…postcards I approve of. You can get lot of postcards for a little bit of money (it’s a good idea to travel with your own stamps, though: touristy places are usually out, and it’s not always easy to get to a post office) and it’s always nice to get real mail, especially when you’re a kid and no one sends you mail. I have pretty much every postcard anyone’s ever sent me, which is a decent number of postcards, but, being mere scraps of paper, they still fit in a single milk crate, with room left over for another couple of decades of postcards. I imagine that I’ll want them toward the end of my life. Every once in a while I dig through them for a bit, but mostly it’s nice to just have a box of tangible proof that people think of you from time to time. 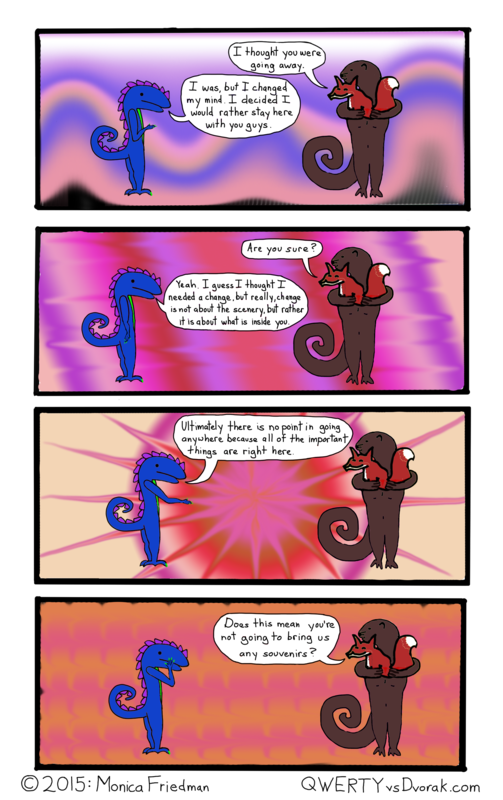 This entry was posted in dragon comics and tagged change, comic, dragon, fox, going away, otter, souvenirs, staying, travel, webcomic on April 27, 2015 by littledragonblue.